An interstellar hero from a distant world visits Earth, and tries to fit in with a mundane, yet kind, suburban family. Shep Ramsey: Get a goldfish. Q: What is Surburban Commando and what is it about? I was flipping through channels and noticed this movie giving, so I decided to see it. 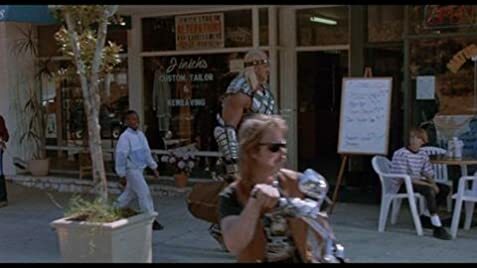 Noticing that the quality of the picture was pretty bad (it was on TV), I pretty much assumed that the film was an 1980's flick due to the poor effects (and also due to the fact that Hulk Hogan's in the movie). Imagine my surprise when I found out it was made in 1991! I will admit... despite the overall cheesiness of the feature, despite the somewhat poor acting, despite the special effects being crap when compared to Star Trek VI (also released around 1991 if I'm not mistaken), I actually enjoyed it. 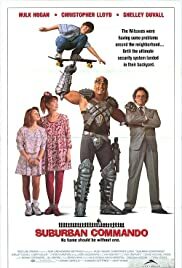 The scenes where Hogan's character (an interstellar hero or something) makes a complete idiot of himself by trying to skateboard or when he whacks a paperboy with his own newspaper are pretty hilarious (some may beg to differ). Of course, the only good part is the one fight scene where Hogan is fighting with two cronies (who happen to be Undertaker and Ed Leslie a.k.a. Brutus Beefcake). Suburban Commando is only worth watching if you're actually into this type of cheesiness. If you want a serious action movie, look somewhere else.